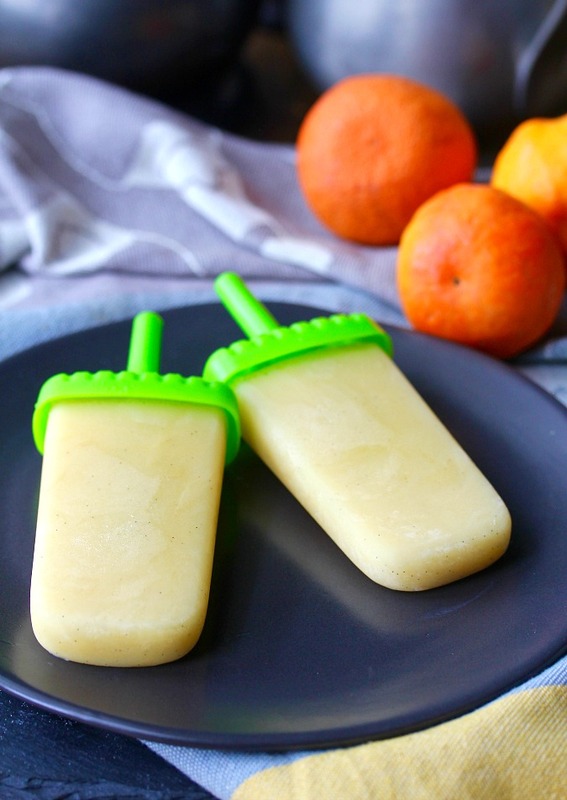 These Orange Cream Ice Pops are like an Orange Julius, but in a popsicle form. These orange cream ice pops also remind me of Creamsicles, but without the ice cream center. The frozen mixture of orange juice, milk, sugar, and vanilla make me feel nostalgic from the memories of going through the Orange Julius drive-through with my dad (along with A&W Root Beer and In'N'Out Burger... not all at the same time of course!). 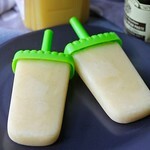 I used vanilla bean paste for the vanilla in these popsicles. 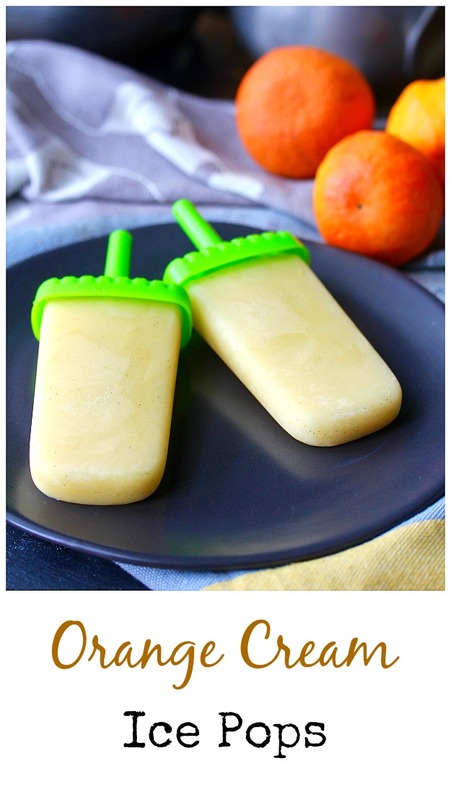 If you look closely, you can actually see the little vanilla seeds floating in the creamy orange ice pops. P.S. If you love the combination of vanilla and orange as much as I do, be sure to check out these Creamsicle shots. 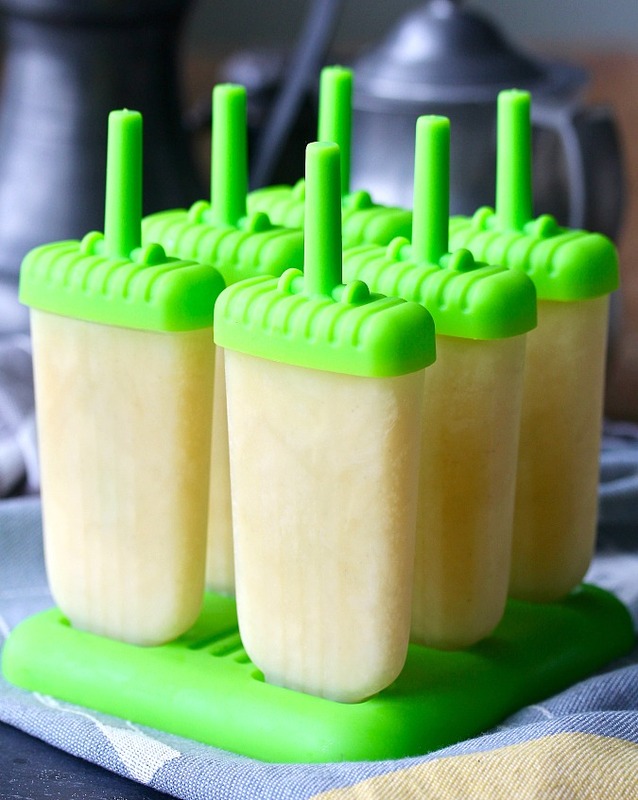 I used to have an old set of those vintage Tupperware popsicle molds (the ones with the circle handles) but at some point I got rid of them in a cleaning purge, and haven't owned any popsicle molds for years. I bought these molds for this post and am really happy with them. I have memories of struggling to remove the frozen pops from the molds, but these were really easy to remove and serve. By the way, these are called Mamasicles, which I thought was weird. It took my husband to figure it out. P.S. If you don't want to buy ice pop molds, you can make these in tiny paper cups, and insert wooden sticks into them once they start to freeze but aren't completely frozen. My grandsons loved these. It might help that I let them have a squirt of Reddi-wip for dipping... that's what grandmas do! These ice pops are from Mark Bittman's Kitchen Matrix: More Than 700 Simple Recipes and Techniques to Mix and Match for Endless Possibilities. Camilla of Culinary Adventures with Camilla, and Wendy of A Day in the Life on the Farm are cooking their way through the book, and I'm joining in as often as I can. I totally recommend this cookbook. This recipe is from the section called Ice Pops +12 Ways. There are recipes for fruity, savory, creamy and boozy ice pops. They all look delicious (I'm trying the banana peanut next), and they are so easy to make. After the recipe, be sure to check out Camilla's Darth Vader ice pops. Whisk together all of the ingredients until all of the sugar dissolved. When ready to eat, run some cold water over the molds to loosen. These would have been my choice too Karen. Sorry I missed out on the fun this week. You've been very busy!!! Thanks for visiting!! I love the little vanilla specks in there. I can't wait to try these. Thanks for joining me this week, Karen. I'm looking forward to all of your June picks. I've got these mold too, they are the best! We are going to love these! They are the best! Thanks! Ohh! I want to check out the cookbook. I have How To Cook Everything and love it! These sound perfect for a hot Florida summer day. It really is a cool book! Mmmmm! I love orange treats, especially during summer. What a perfect way to cool down!